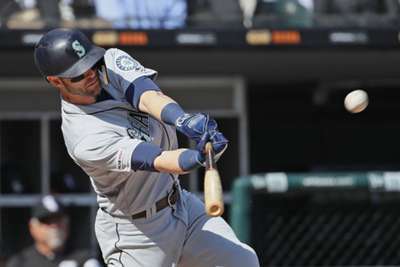 The red-hot Seattle Mariners just keep on winning in MLB following their 7-6 victory over the Kansas City Royals. With their win after 10 innings on Thursday, Seattle are 13-2 through 15 games – one of the hottest starts in league history. And on Thursday, the Mariners did it once again as they have all year long. Seattle hit home runs and they came back to win. Mitch Haniger's triple to centerfield in the top of the ninth inning brought two runners around to score and tie it up at 6-6. The Mariners would add a run in the 10th inning as well to win it on a Dan Vogelbach homer. Dee Gordon also added a home run, marking the 15th successive game to start the year in which Seattle hit a homer – a MLB record. Oakland Athletics designated hitter Khris Davis went two-for-five with two homers and three RBI's in the team's 8-5 win over the Baltimore Orioles. He now has nine homers for the season which leads MLB. Cleveland Indians starter Shane Bieber tossed seven scoreless innings with six strikeouts in a 4-0 shut-out victory against the Detroit Tigers. St Louis Cardinals right fielder Jose Martinez went four-for-five with a double and an RBI as the team defeated the Los Angeles Dodgers 11-7. Toronto Blue Jays closer Ken Giles blew his first save since 2017, allowing two runs while walking three and recording just one out in a 7-6 loss to World Series champions the Boston Red Sox. Who says you cannot beat the shift on an inside pitch? Joey Votto somehow took a delivery on the inner half and put it past the shift on the left side to place a runner in scoring position. See, you do not have to pull the ball all the time guys. The Cincinnati Reds beat the Miami Marlins 5-0. The Mets got the better of the Braves on Thursday, but Atlanta have Sean Newcomb (0-0, 1.64 ERA) on the mound, who has been very good to start the season. Zack Wheeler (0-1, 10.24) has been bad for the Mets, so Atlanta may have a chance to get one back on Friday.